Your clear brand is the launchpad to promote and grow your business. Clarifying your brand automatically answers ALL these questions. Your clear brand will provide a solid foundation – the launchpad! – to promote and grow your business. Better yet, you’ll discover that clarity is rocket fuel! Armed with a clear brand, you’ll tap into a wellspring of focus and energy. It’s not a Unique Selling Proposition (USP) or Positioning Statement. These are sales and marketing statements. Your brand is not tactile; you can’t pick it up and hold it in your hands. I believe branding is a CONCEPT that is foundational to your business. Know this: Your marketing efforts will NOT be effective if you’re not clear about your brand. If your brand is not clear – meaning that you cannot quickly communicate Who you are, What you do, and What they get – then your promotion efforts and marketing tools (including website) will miss the mark. Without a clear brand, it’s REALLY CHALLENGING to grow your business! In my 12+ years as a Marketing Consultant & Branding Expert, I’ve consulted with hundreds of small business owners to clarify their brands. (Yep, literally hundreds.) This led me to create my proven “Nail Your Brand” approach, which identifies the unique Brand Elements™ for you and your business. Before that, in my 25-year corporate marketing career, I primarily was Marketing Communications Manager for a variety of high-tech corporations. On any given day, I led teams on complex website projects including 2 Hewlett-Packard websites with $250,000 budgets; big-budget advertising, direct-marketing, and public relations campaigns; and $100,000 tradeshow events. Plus, I wrote marketing copy for umpteen brochures, newsletters, ads, white papers – and even wrote a case study published in Fortune magazine. Together, we clarify your brand – You gain clarity about the unique expertise your business offers, your target market and their needs/challenges, and the benefits / results your customers receive. Next, we identify the ONE key, overarching benefit your customers get, which can be honed into your tagline (aka promise statement). Next, we identify your Brand Elements™ – These key elements must be consistently presenting throughout your marketing toolkit, including your website. It’s important to note that you have NO homework assignments or worksheets to prepare for this fast-paced branding process. Just “show up” in our conference calls, and answer my questions honestly based on your expertise, experience, and intuition. You get a customized “Nail Your Brand” document – Your personalized, at-a-glance branding document serves as a touchstone for you. Plus, it serves as a guide for all team members (designer, social media/content marketing person, website developer, etc.) to apply your Brand Elements™ consistently in all marketing tools: your website, social media profiles, press releases, and so forth. 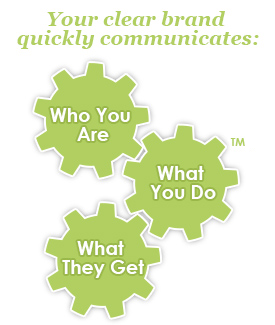 Your clear brand is the launchpad to promote and grow your business. Ready to get started? You’ll enjoy this fast-paced, exciting, results-driven process – a highly customized process that will energize you and your business. Contact me NOW – let’s get started today! Your clear brand is the rocket fuel to promote and grow your business. Click HERE to schedule your free 30-minute consultation.